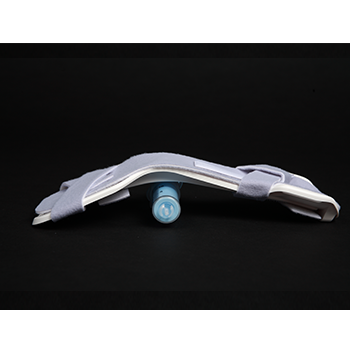 mBrace™ wrist support devices can be used for extending and stabilizing the wrist at a consistent 40° angle during vascular access procedures, including arterial line insertions and cardiac catheterizations using the radial artery or vein. 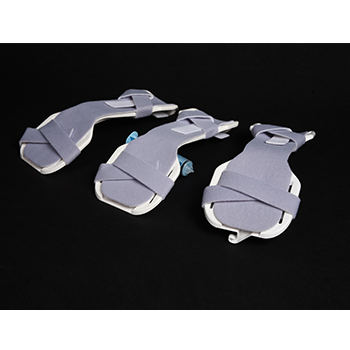 Made with soft comfortable material, mBrace has a flat front edge to provide a stable wrist support platform and helps to prevent patients from flexing their wrist during extended arterial line deployments. With its wasp waist shape, mBrace has been specifically designed to be worn when deploying our RadAR and Zephyr Vascular Compression Device as well as a wide array of other radial compression bands. The mBrace devices come in three models. The Model 4200 is our standard mBrace Wrist Support device. The Model 4250 device has a hook at the distal tip of the device that integrates with the Elevate Arm Board. The Model 4275 device has a convenient clip attached on the underside in which a syringe can be attached and secured for patient transport. This helps avoid loss of the syringes used with inflatable radial hemostasis devices. 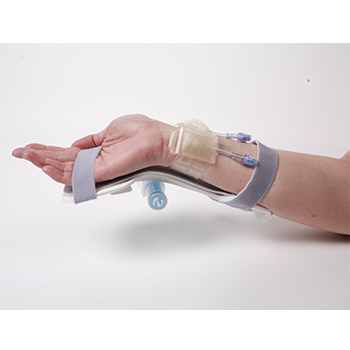 mBrace™ is used by clinicians when inserting arterial lines or catheters into the radial artery or other arteries in the wrist.